THE MUSIC SNOBS PODCAST – Episode 032: Who Sold the Soul? THE MUSIC SNOBS is the podcast where Scoop Jackson, Isaac Perry, Jehan, and Arthur Turnbull discuss, debate, and deconstruct the music and musicians who both fascinate and frustrate them. ISAAC PERRY Writer and Lead Creative at Paradox Media; Author of the novel ALL FALLS DOWN. Isaac has profiled music artists for magazines such as XXL, VIBE, DIME, AND THE MUSIC EXPERIENCE MAGAZINE. JEHAN B London-based attorney and musician. Jehan also engineers TMS with Arthur. ARTHUR TURNBULL The moderator and lead voice of THE MUSIC SNOBS; web worker and music critic. Arthur also engineers TMS with Jehan. This is episode 32 where The Music Snobs get to the bottom of what may be America’s greatest loss: the possibility that black American music is no longer a black American art form and is loved (and supported) more passionately by our UK cousins than ourselves. Also, the crew keeps hope alive by asking each other to name the one artist they believe will one day achieve greatness, despite the odds—and the Snobs—stacked against them. Skladiščni prostori v poslovni stavbi Slovenijalesa se zaradi svoje lokacije ter karakteristik prostora odlično ujemajo z željami ustvarjalne ekipe. Kurzschluss letos gradi na izjemnemu programu z glasbeniki, ki s svojimi nastopi polnijo tudi največje koncertne dvorane. V klub prihaja več kot dvajset mednarodno nagrajenih glasbenih ustvarjalcev, skupin in DJ–jev, kar napoveduje najboljšo izkušnjo zabave v prestolnici. Ponočnjaki bodo od – otvoritve – 28. novembra do 31. decembra lahko uživali vsa petke in sobote, tudi kaksno sredo in četrtek, posebno presenečenje pa prihaja v obliki božičnega koncerta in odštevanja zadnjih minut starega leta. Seveda pa obiskovalce čakajo še druga darila in presenečenja glasbenikov. 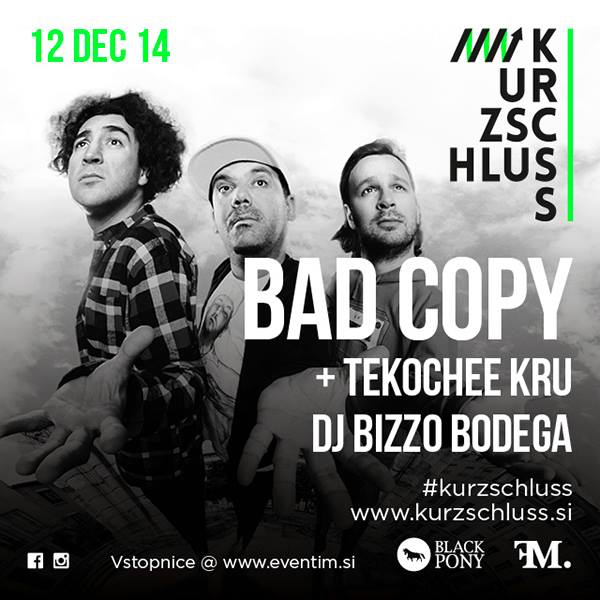 12.12. v Kurzschluss prihajajo prvaki srbskega rapa – BAD COPY (Wikluh Sky, Ajs Nigrutin, Timbe) ob podpori mariborskih TEKOCHEE KRU (Tekochee Kru so pred kratkim izdali novi album po 7.letih z naslovom SABLJASTI TIGER ) in zagrebškega DJ-ja BIZZA BODEGE (Bolesna Brača). BAD COPY – ESI MI DOBAR ? Song SUMMER MADNESS was released on their fifth album – LIGHT OF THE WORLDS in 1974. It was a landmark in the funk/jazz fusion genre of the 1970s. Light of Worlds was by far Kool & the Gang’s most spiritual and sophisticated work, produced in the wake of the success of their previous album, Wild and Peaceful. While it was their seventh album of new material, the Gang considered Light of the Worlds their ninth LP (counting two compilations), and therefore consciously chose nine songs for the album, to represent the nine planets in the solar system. The album contains rock-inspired funk set to jazz-informed playing with afrobeat influences and a tinge of analogue synthesizing. 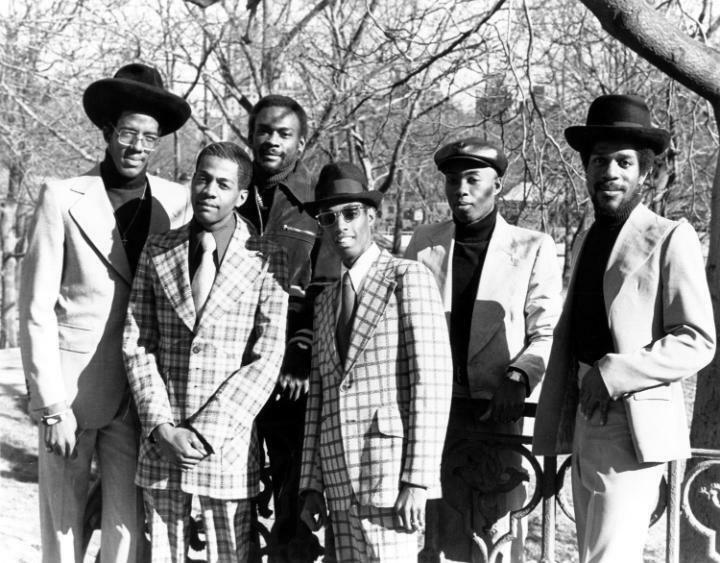 KOOL & THE GANG – SUMMER MADNESS is one of the most sampled songs. Here are just few samples.